I used the emboss resist technique for both the ocean and the beach. This technique consists of stamping with Versamark, then heat embossing with either clear or colored powder. 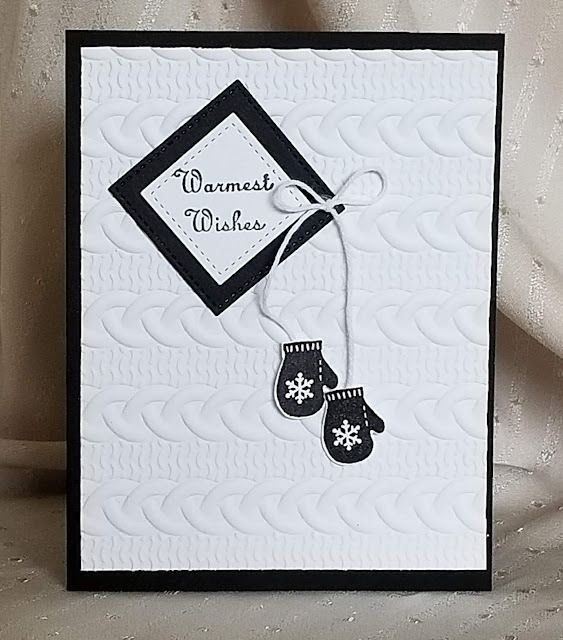 After the card cools, you can sponge colors over the top of the heat embossed area to allow you to see through the embossed pattern to the cardstock color below, or to complement the color of your embossing powder. For my waves, I used white embossing powder. For my beach, I turned the stamp "upside down" so the peaks ran the mirror image of the ocean waves. Then I first inked my stamp with Versamark, then with SU Crumb Cake before sprinkling clear embossing powder and heat setting. The ocean was sponged with SU Tranquil Tide, Bermuda Bay, and Marina Mist inks. I used a Post-It Note to mask off the sky and the beach before starting to sponge the water. The beach was sponged with SU Crumb Cake and Early Espresso. The sky was created by sponging SU Marina Mist ink (using a Post-It Note mask to cover the ocean) lightly, then sponging once again using a scallop circle diecut to form clouds. 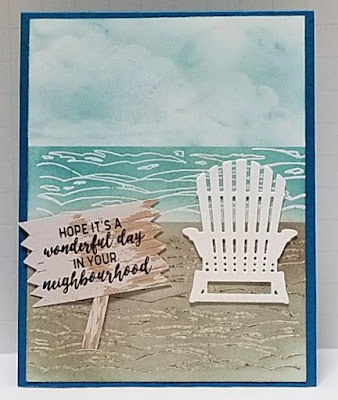 The Adirondack chair was made by die cutting three copies of the chair die from the SU "Seasonal Layers" framelits die set, and gluing them stacked atop one another with Tombow. They were attached to the card front also with Tombow. The sign was made using a weathered wood pattern from the SU "Wood Textures" designer series paper. I stamped the multi-word sentiment from the 2017 retired SU "In the City" stamp set using SU Early Espresso ink. I used paper snips to cut a rough edge on the two sides of the sign to make it look more weathered. The sign was attached to the card front using two stacked layers of Mini Glue Dots to raise it slightly off the paper for dimension. The finished front panel was then glued to the SU Tempting Turquoise card base (4.25"x 11" folded in half to form a top folding card). I am rating the difficulty level of this card as a "2" out of a possible "5". All the steps are very easy, and sponging is such a forgiving technique for even the beginner. I was wondering how you'd made such great waves! Should have known there'd be a stamp for it! You've created a lovely summer sky too. It's a great combination of products to create a lovely card. Thanks for joining us at Retro Rubber Challenge this week. 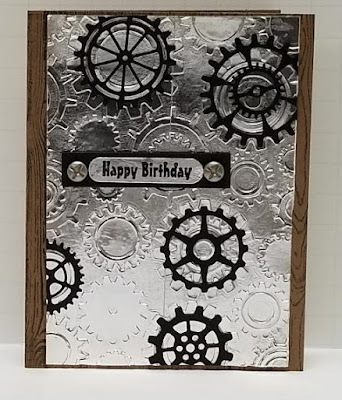 Wow, Donna, what a wonderful combination of stamping and heat embossing. 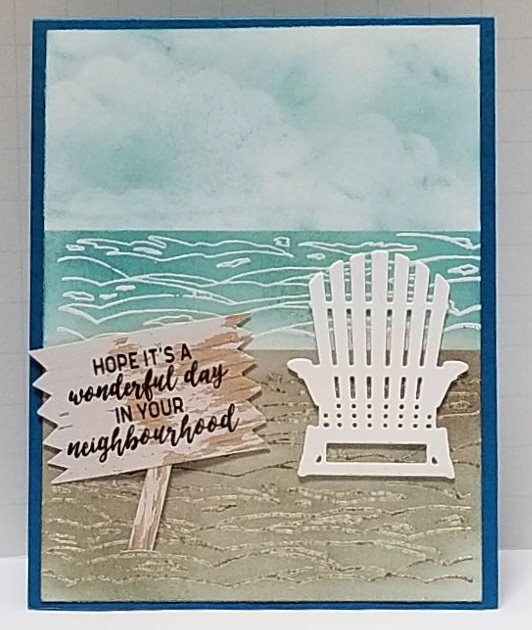 Your seaside scene looks so serene that I can almost hear the waves and really want to sit in that lovely Adirondack chair with a nice, cool drink. That sign and its sentiment make me think of Mr. Rogers and his neighbourhood on TV. Loved that show. Thanks so much for joining our Watercooler Wednesday Challenge this week. This card is wonderful and absolutely worth the effort! Great use of all the various techniques. Thank you for playing with us at Retro Rubber and hope you will join us again soon. That sand looks so real that I can feel it between my toes while I'm relaxing in your chair. Great card. 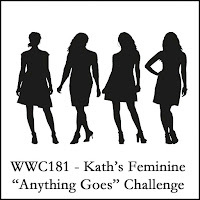 Thanks for playing with us this week at the Watercooler Wednesday Challenge. That's my kind of day, sitting at a beach, listening to the soothing sounds of the waves, enjoying the beautiful sky and the warmth of the sun. Your card depicts exactly this fabulous scenario and I thank you for sharing it with us at RETRO RUBBER, hope you can play again soon. Love your beach scene! Love all your stamping and heat embossing. Thanks for playing along with Retro Rubber Challenge blog. Wonderful beach scene! Thanks for joining us at Watercooler Wednesday Challenge! You're right..your stamp makes awesome waves AND sand! Very clever! I love your sweet little scene, I wish I was at the beach right now! Thanks for sharing this with us at Retro Rubber this week!